You don’t hear about it much in the news any more, but it hasn’t gone away, it’s still a problem, and it’s only getting worse. The depleting ozone layer. And it’s only one of many reasons to make sure your makeup and moisturizers contain an SPF 30 (Sun Protection Factor) as well as what you apply to the rest of your body when exposed to the sun. Let’s go through this in detail so that I can adequately impress upon you just how important this is. The harmful UV rays that get to the earth’s atmosphere are now stronger than ever, making us all at greater risk of skin cancers (basal, squamous, melanoma), premature aging, etc. While we do need our daily dose of Vitamin D, getting it on a daily basis does not imply we should put our health at risk. Applying a sunscreen actually blocks harmful rays from penetrating the skin and triggering skin disorders, but it works best if applied often. While all of us seem to appreciate the “glow” a suntan or even the hint of a burn offers our appearance (we somehow equate this with looking healthier), studies have revealed that people below the age of 55 who used sunscreen regularly had a 24% lessened chance of developing signs of aging than non-users or even occasional users. Even though many sunscreen users use SPF-laden products for beauty reasons (who likes wrinkles? ), particularly for women in their 20s, melanoma becomes the most life-threatening form of skin cancers. It’s during our younger years when we set the stage for skin disorders that can appear fairly suddenly later in life. Another reason to use a sunscreen liberally is to prevent the onset of irritating blotchiness and eruptions of red veins. Potential results of this tendency toward blotchiness is the onset of acne and other sun-ray induced types damage. Did you know that sunburns weaken your skin, subjecting it to easier bruising? I’ll bet that’s a new one for you. If your skin has suffered repeated attacks of peeling, swelling, redness, hives and itching from the influence of UVB rays, those blisters can escalate the risk of skin cancer. 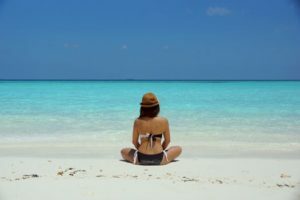 A study published in ‘Annals of Epidemiology’ in August 2008 suggested that repeated occurrences of sunburns actually places you at a higher risk of lethal melanoma. So what if you’re one of those individuals we all used to envy — the ones who rarely, if ever burned, tanning easily? One of my clients is of full Mediterranean background, and her entire life she thought because of her ethnic background and easily-tanned skin, she was less subject to skin cancers than those of northern European descent. From her teens through her 40s and even into her 50s, she laughingly called herself “phototropic,” avidly following the sun from morning until the late afternoon shadows began to appear, taking every opportunity to maintain her tan from spring through the fall months. One day she noticed what appeared to be a new “freckle” on her inner thigh. Each time she re-examined it, it had changed in shape, size and appearance. So she went to a dermatologist who agreed it was suspect and took a biopsy. It turned out to be a superficial form of melanoma, but melanoma nonetheless, resulting in a 6-inch diameter slab of skin being removed all around it just to catch any cells that may have migrated nearby. Since then, she had another removed from her other leg, and now she sees her dermatologist every six months for a head-to-toe exam, since these lesions can happen anywhere on her body — scalp, under her toes, on her back — in all those places she could never see on her own. I am not telling all of this to scare you. Well, perhaps I am. Because I care. Those of you who come in regularly for facials know one of my last steps (some clients know their facial is almost over because they can detect when this is happening) is to apply is an SPF product to your face, lips and neck. I use and heartily believe in the Lira line of products. Lira’s Solar Shield 30 Oil-free SPF offers 21% zinc oxide (remember that white stuff lifeguards use on their noses?) for UVA/UVB protection, Yarrow Root extract, which is antiallergenic and releases heat from the skin, Slippery Elm as a soothing protectant, both Lilac Plant and Echinacea Stem Cells, which brighten skin, prevent breakouts, and aid in wound healing, Reservatrol and Oat Extract, which prevent UV aging, calm and soothe your skin, and Halidrys Siliquose Extract, which contains a natural SPF, anti-bacterial and brightening component. So as the summer days continue lazily into fall, I hope you heed the information I have offered here. Fortunately, the beauty industry has come up with clever ways for us to have the kind of glow we used to get from the sun — from face and body bronzers to tanning sprays that permit us to go bare-legged, to all-over tans when we hate going to the beach or pool with too-fair-looking skin. Tan lines? Make it a thing of the past. With all the research that has been done as well as products like the one I just described, we now all have the ability and tools to prevent the worst from happening.